This mother duck watches over part of her brood while UB staff members rescue the others. Four UB employees executed a dramatic rescue near the Student Union on the North Campus on Monday, saving the lives of six baby ducklings that had fallen into a storm drain. This feel-good tale began when Sheryl Deneke, staff assistant in the Office of the Vice President and Chief Information Officer, decided to take advantage of the beautiful July day and take a lunch-break walk across campus with her friend, Susan Stouter, senior staff assistant in the University Libraries. As Deneke and Stouter approached the Student Union, they found themselves face to face with a distraught mother duck. 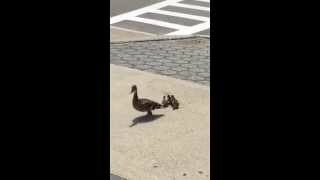 The duck rushed up to Deneke and Stouter, as well as to nearby UB Police Officer William Malican, quacking in distress. “She would always run back to the same spot by a storm drain,” Deneke said. “When I saw the duck near the drain, I knew instantly that was the problem,” said Stouter, who had witnessed the same situation before and immediately assumed the duck had babies stuck in the drain. Sure enough, upon a closer look, Deneke, Stouter and Malican discovered six ducklings trapped below them. Malican called University Facilities to see if anything could be done. Jim Scripp, supervisor of grounds, arrived soon after and sized up the scene. Scripp grabbed a crowbar from his truck and pulled the grate off the drain. “He took one of those paper-pickers out, laid on the ground halfway down the hole and, one by one, pulled the little ducklings out,” Deneke said. Scripp has seen ducklings fall through grates every spring and summer. Deneke and Stouter said it was a very emotional scene as each duckling was pulled out. A crowd had gathered, and when Scripp pulled the final duckling out, spectators applauded. “We both told Jim and the cop that they were our heroes,” Deneke said. Watching the lucky ducks waddle away, Deneke and Stouter were amazed by the mother duck’s resourcefulness. “We thought it was so amazing that the mama duck knew enough to ask humans for help,” Deneke said. Thanks for the feel-good story! I'm always happy when humans care about helping our animal friends. Could someone please put a finer mesh over that storm drain? All bird-lovers and particularly duck-lovers salute all of you who "saved the day!"